Composition by Barry Guy (PRS/MCPS). Coordination: Joanna Gratkowska. Recording engineers: Jaroslaw Regulski and Zbigniew Kusiak. Within the 71 minutes composition The Blue Shroud, we have inserted 11 PQ-Codes. This is to facilitate access for our listeners and radio programmers to specific passages within the piece. 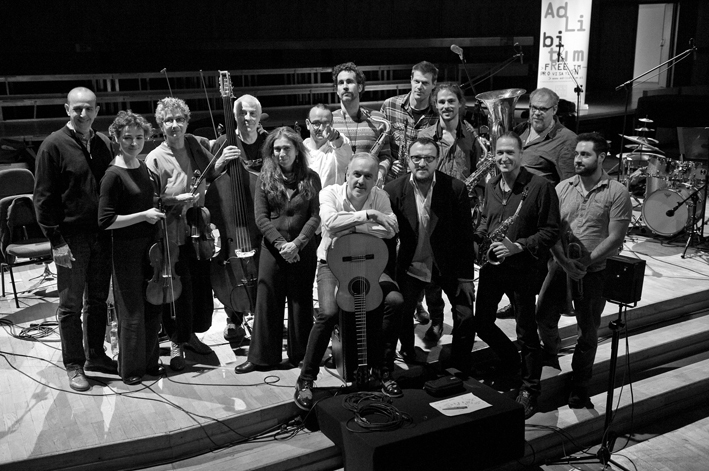 Barry Guy hat nach den grossen Werken für das London Jazz Composers Orchestra und das Barry Guy New Orchestra eine Komposition für ein neues internationales Ensemble geschrieben: für MusikerInnen, die sowohl in der Welt der europäischen Komposition als auch in der aktuellen Improvisationsmusik zu Hause sind. Guy's Komposition «The Blue Shroud» ist eine Hommage an Pablo Picassos Bild «Guernica». Sie erinnert an die Opfer des Bombardements, aber auch an die Verhüllung der Guernica-Tapisserie im UN-Sicherheitsrats durch ein blaues Tuch, bevor der US-Außenminister Colin Powell im September 2003 der Welt die Bombardierung und den Einmarsch in den Irak ankündigte. Die Kraft von Picassos «Guernica» versus die Macht der Militärs. Barry Guy arbeitet mit Techniken der neuen Musik, der Jazzimprovisation, ebenso wie mit Barockmusik und einem Poem der irischen Schriftstellerin Kerry Hardie. Für die Sängerin Savina Yannatou hat er die Gedichte in ergreifende Songs gefasst. Musika­lische Fragmente von Heinrich Ignaz Franz Biber und Johann Sebastian Bach werden in die Komposition aufgenommen und führen zu den für Barry Guy typischen Klangsensibilitäten. «Dieses Werk ist die Krönung der langen und vielseitigen Karriere von Barry Guy», schrieb die New Yorker Jazzzeitung «The New York City Jazz Record» nach der Uraufführung des 70-minütigen Orchesterwerks. 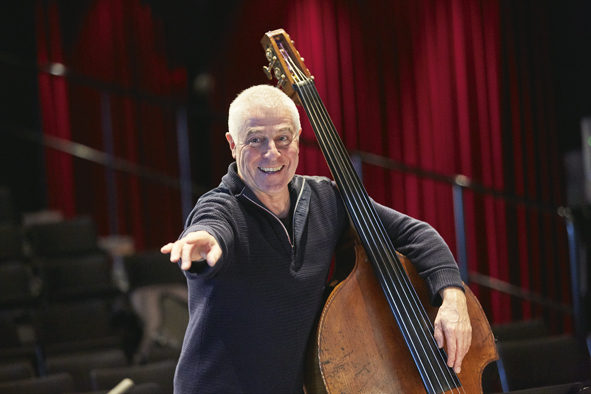 After his great compositions for the London Jazz Composers Orchestra and the Barry Guy New Orchestra, Barry Guy has written a large scale work for a new international ensemble. Guy's work The Blue Shroud is an hommage to the painting Guernica by Pablo Picasso. It is for the people of the Spanish town, who were victims of the Nazi German air force bombardment during the Spanish Civil War. Guy also wants us to remember the occasion in 2003, when the Guernica-tapestry at the UN Security Council was obscured by a blue drape as Colin Powell made the case for invading Iraq. The strength of art against the power of the military, government and the media. 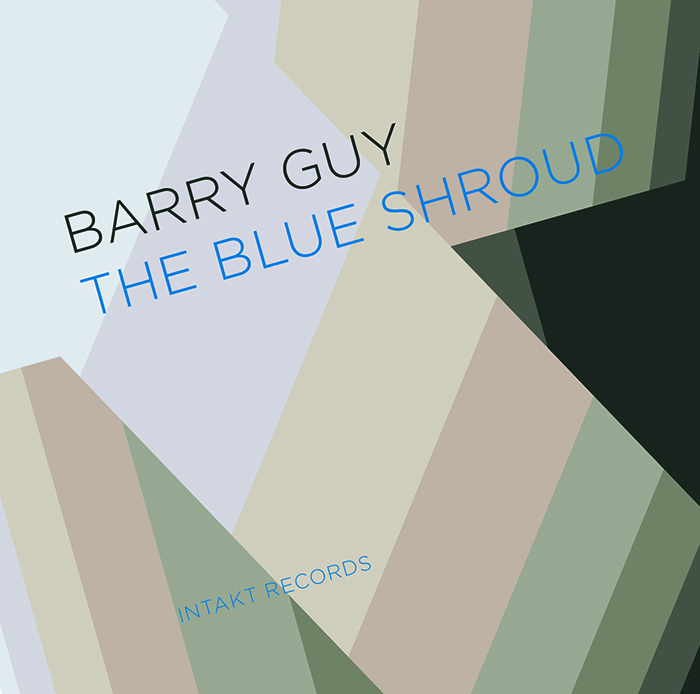 Barry Guy uses the techniques of new music and jazz improvisation, as well as fragments of Baroque music and a poem by Irish writer Kerry Hardie. He has transformed the poem into moving songs for vocalist Savina Yannatou. Fragments of compositions by Heinrich Ignaz Franz Biber and J.S. Bach are mingled into Guy's intricate work. "The work might just be the crowning achievement in the Englishman's long and varied career", wrote The New York City Jazz Record magazine after the premiere of the 70 minute long masterpiece.